From "Today Explained" to "The Gist" to "The News" to "Still Processing," distributing the news has become much more innovative and bite-sized. 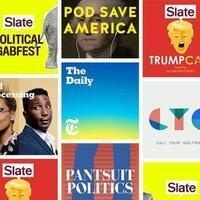 Journalists at BuzzFeed News, Slate, Vox Media, and WNYC talk about the process of news gathering, telling the same story for different platforms, and how they engage with their audience. Presented by the Center for Communication with The School of Media Studies at The New School, and the Mayor’s Office of Media and Entertainment.